Accommodation in good quality hotels and guest houses on a twin share basis. Unspoiled wilderness trekking in Romania’s Southern Carpathian mountains with stunning scenery from first step to last. This trip has all the ingredients for the perfect walking holiday. With superb, challenging walking, fantastic alpine scenery, characterful home-stays with great home-cooked food for a closer insight into rural Romanian life, good hotels, and an evening out in the beautiful, culturally rich town of Sibiu. As the legendary home of Count Dracula, the Carpathian Mountains have a dark mysterious image but the reality couldn’t be more different. Welcome to a region of superlative alpine scenery, charming mountain villages and wonderfully hospitable people. In these rural areas little has changed for centuries; you will see small summer lodges built for the hay harvest, sheep trods through forest and meadows, and shepherds riding on donkey carts. Romania is home to one of the largest remaining areas of pristine forest on the continent, with deep forest covering more than a quarter of the country. Bears, wolves and lynx thrive here, the highest concentration of large carnivores anywhere in Europe. Trekking through two regions of the Carpathians – the Bucegi Natural Park and the Fagaras Mountains – you will enjoy bucolic scenery; emerald green valleys nestled between foothills ascend through swathes of ancient forest to wild crags, dramatic peaks and precipitous gorges. In the summer, the forests are a riot of colour and birdsong whilst the meadows are alive with a flamboyant carpet of colourful wildflowers, and all around are signs of a way of life seemingly forgotten by time. The fully-supported trekking on this trip is stunning, challenging and rewarding, with ascents of around 1,000 meters most days, often with a summit as your goal. The walking around Sinaia, Bran and Margura is delightful, with superb views at every turn. In the Fagaras Mountains it becomes craggier and more dramatic, with extensive rocky ridges. Accommodation is a perfect mix of good standard hotels in towns, and attractive, comfortable guest houses in the villages. Staying for some nights in the guest houses gives you a unique insight into the way of life of Romania’s rural population, and you will find the owners to be the perfect, warm-hearted, friendly hosts. They will also cook your evening meals and give you a hearty breakfast in the morning so you are suitably fuelled for your day’s hike. There is plenty of cultural and historic interest on the holiday, and your expert guide will bring it all to life for you. No visit to historical Transylvania would be complete without a stop at imposing Castle Bran, the legendary home of Dracula, and your last night is spent in the beautiful, culturally rich town of Sibiu. Meal arrangements: 7 breakfasts, 6 lunches, 3 dinners. Fly from London to Bucharest. Drive to Sinaia. Trek from Sinaia to Bucegi and down to Pestera. Trek to Batrana Peak and descend to Bran. Visit Bran Castle. Trek to Magura Peak and descend to Magura. Walk up to Piatra Mica Peak and return to Magura. Drive to Balea Lake. Ascend Vanatarea lui Buteanu, 2,500m. Trek theBalea Lake Circuit and Doamna Valley.Drive to Sibiu. Drive to Bucharest airport. Fly to London. Our Carpathian Mountains holiday will be led by a very experienced and qualified Romanian Mountain guide who speaks excellent English. Guides include, Andrei, a professional mountain guide whose passions are rock-climbing, ski-mountaineering, walking, history, cooking and many more! Day 1 - Fly from London to Bucharest. Group transfer to Sinaia 1½ - 2 hours. There is a single, timed group transfer from the airport to your hotel in Sinaia. The drive takes 1½ - 2 hours to Sinaia, a lively attractive skiing resort, with stunning architecture. There are beautiful views of the Bucegi mountains and surrounding forests. The town is home to a 17th century monastery, formerly a royal family residence and German neo-Renaissance castle - Peles Castle. Commissioned by King Carol I in 1873 and completed in 1883, the castle served as the summer residence of the royal family until 1947. Its 160 rooms are adorned with the finest examples of European art, Murano crystal chandeliers, German stained-glass windows and Cordoba leather-covered walls. 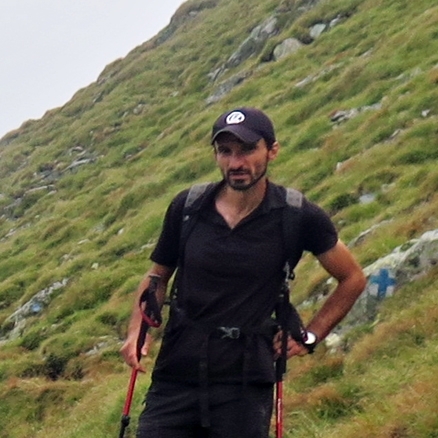 Day 2 - Walk from Sinaia to Bucegi Plateau, 1,900m (and extension to 2,200m), and down to Pestera, 1,600m – 6 hours. From your hotel you begin walking uphill. You soon leave the road taking a well defined stony path, which zig zags up through the forest. It's a pleasant walk through a mixture of fir and beach trees. Eventually, after about an hour of climbing, you emerge into the open hillside where you'll see the royal sheepfold. You continue upwards on a well marked trail on open hillside until you reach the plateau. You'll see a hotel here which is where Romania's sports teams head for altitude training. There is a giant cross on top of a hill which was built after WWI. No doubt you will find a suitable spot on the plateau to stop for lunch. There are great views to be had of the surrounding mountains, dramatically steep limestone cliffs, and you can see back down to Sinaia. You continue to ascend slightly until you reach the conglomerate outcrops known as the 'Sphinx' and 'Babele' (the Old Ladies). This is a popular spot for Romanians to visit and most come up by cable car. You descend for 1½ - 2 hours first on the open hillside, and then through mixed forest, until you reach Ialomita River Valley and your hotel - a large white building which you will see as you start descending. There's a sauna, Jacuzzi and indoor swimming pool in this hotel to relax tired muscles! Total ascent/descent on walk: 1,200m ascent, 600m descent. Day 3 - Walk to Batrana Peak, 2,200m, and descend to Bran - 7 hours. You leave the hotel and begin ascending on a winding trail, past sheep enclosures and meadows towards a waterfall. You continue climbing the western ridge of the Bucegi Massif until you reach Batrana Peak at 2,200m, marked with a small cairn. You'll see a refuge just below. There are excellent views here of the surrounding mountains, valleys and meadows, dotted with neat haystacks and wooden huts for storing hay. Your route is an ancient passage for shepherds and their flocks and you will see sheep being shepherded up the mountain, as this way of living is still very much alive. During the time of the Austrian-Hungarian Empire, this was also a smugglers route. In front of you lies Bran Country, with a landscape shaped by millenniums of pastoral life and traditional habitation. You start descending along the big limestone and granite walls and then into the woods, heading towards Bran village where you will spend the night. Day 4 - Visit to Bran Castle. Walk to Magura Peak, 1,350m, and descend to Magura - 4-5 hours. Today you start the day with a visit to Bran Castle, also known as Dracula's Castle. Author Bram Stoker never actually visited Romania. Instead he is believed to have created his imaginary castle, home of fictional character Dracula, from an 1865 book on Transylvania which describes Bran. The origins of the real Bran Castle date back to the early 13th century and the Teutonic Knights who erected a citadel there to defend the southeastern border of Transylvania. Today an aura of mystery still surrounds the conical towered castle which is dramatically situated on a rocky outcrop, and there is plenty to explore, inside the museum and out. Castle visit over, you start your walk, climbing towards the village of Magura. The trail weaves north and south of an ascending ridge, from sunlight to shade, from hay meadows to wild forest, up to Magura Peak. A quick descent brings you to this dispersed typical mountain village where you'll stay in a guest house. Total ascent/descent on walk: 700m ascent, 500m descent. Day 5 - Walk up to Piatra Mica Peak, 1,800m, and return to Magura - 7-8 hours. Your walk today starts by leaving Magura village and descending for half an hour to the first of the gorges. You walk through the spectacular Zarnesti Gorges, a narrow limestone passage leading up to the wooded slopes of Piatra Craiului mountains. You then cross a patch of virgin forest opening into the meadows at the feet of the craggy eastern side of the Northern Ridge. You then ascend through green meadows to Curmatura Hut (1,450m) for around two hours. This is a lovely hut, nicely decorated inside and with a terrace with a great view of surrounding meadows and soaring limestone cliffs. After a stop for tea at the Curmatura Hut and a well-earned rest, you continue to climb Piatra Mica Peak at 1,800m, 350m above the hut. This is initially on a good trail to a viewpoint just above the Crapauturii saddle, and then there is a steeper rocky section which involves a short scramble with a fixed chain for assistance. The summit is marked by a giant metal cross and there are fabulous views from here. It's a fine place to stop for lunch, weather permitting. It takes about 3-4 hours to reach here from Magura. You then have a fairly steep, rocky descent through the forest for 400m until you reach Zanoaga Meadow and its old sheepfold. A steep, winding descent through the woods brings you back to the start of the gorges. You then have a short sting in the tail - a half an hour ascent to take you back to the start of your walk at Magura. Day 6 - Drive to Balea Lake. Walk in the afternoon to Vanatarea lui Buteanu, 2,500m – 4 hours. This morning you will drive to Balea Lake, a popular spot for hikers with stunning mountain scenery. In the winter it becomes a ski resort for expert skiers and snowboarders with off-piste skiing on the longest slope in the Carpathians. It's accessible by road in summer and by cable car in the winter. Here you are in the extremely impressive and dramatic Fagaras Mountains, the highest range in the Southern Carpathians. Romania's highest mountain here is Moldoveanu Peak at 2,544 although this won't be your objective today. Here. Instead in the afternoon, you will ascend a spectacular 2,500m rocky peak called Vanatarea lui Buteanu. The scenery is craggy and impressive here and there is an extensive rocky ridge. You descend on a well-worn trail towards Balea Lake where you will stay at the simple Cabana Paltinu hotel. Total ascent/descent on walk: 500m ascent, 500m descent. Day 7 - Balea Lake Circuit and Doamna Valley walk - 6–7 hours. Transfer to Sibiu - 70 km. After breakfast you climb to Capra Saddle and then Lezerul Caprei Peak, walking a circuit of the upper glacial circ of Balea. You complete the tour with wonderful views of Wallachia to the south and Transylvania to the north, following the main ridge of Fagaras massif up to Paltinu peak and then down Doamna Saddle. Here you start a 1,000m descent on the tranquil Doamna Valley. Once you reach the treeline you make a short climb to swap to Balea Valley where the transport is waiting to take you to Sibiu. Total ascent/descent on walk: 500m ascent, 1,300m descent. The medieval city of Sibiu is one of the cultural highlights of your trip. Together with Luxembourg it was the European capital of Culture 2007 and its wealth of museums, architectural treasures and cultural objectives is not to be missed. Day 8 - Group transfer to Bucharest 5-6 hours. Flight home. After breakfast today you will drive back to Bucharest airport, and fly home.